Myrcene is a monoterpene and an important precursor to many terpenes. It has a woody, vegetative, citrus, fruity, and mango-like scent. Myrcene is hypothesised to help compounds enter cells through enhancing membrane permeation. Myrcene has been shown to be an analgesic in mice and did not cause tolerance to the effect. 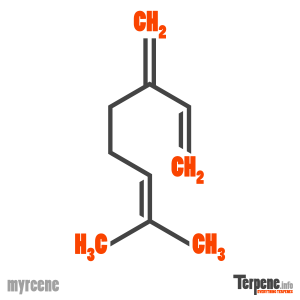 Ther terpene is also noted to have antioxidant effects with mutagenic compounds. Another benefit to myrcene is its ability to relax muscles and induce sleep. Oral administration of myrcene in rats was concluded to produce a dose-dependent pain relief for the hyperalgesia induced by subplantar injections of either carrageenin or prostaglandin E2, but did not affect that induced by dibutyryl cyclic AMP. These results indicated a peripheral site of action. In contrast to the central analgesic effect of morphine, myrcene did not cause tolerance on repeated dosing in rats. Myrcene shows promise as a lead for the development of new peripheral pain killers with a different method of action than aspirin-like drugs. Myrcene was explored as a sedative in the mouse model. Muscle relaxation was seen as observed through the rota rod test. In addition there was an increase in sleeping time by 2.6x. Central effects of citral, myrcene and limonene, constituents of essential oil chemotypes from Lippia alba (Mill.) n.e. Brown. Storage: 2 – 8 C, proper ventilation, spark proof environment. Flammable liquid and vapor. Store in a well-ventilated place. Keep cool. Store locked up. Keep away from heat / sparks / open flames / hot surfaces. No smoking. Keep container tightly closed. Ground / bond container and receiving equipment. Use explosion-proof electrical / ventilating / lighting / equipment. Use only non-sparking tools. Take precautionary measures against static discharge. In case of fire: Use dry sand, dry chemical or alcohol-resistant foam for extinction. May be fatal if swallowed and enters airways. Causes skin and serious eye irritation. Wash skin thoroughly after handling. Wear protective gloves / protective clothing / eye protection / face protection. IF SWALLOWED: Immediately call a POISON CENTER or doctor / physician. IF ON SKIN (or hair): Remove / Take off immediately all contaminated clothing. Rinse skin with water / shower. IF IN EYES: Rinse cautiously with water for several minutes. Remove contact lenses, if present and easy to do. Continue rinsing. Do NOT induce vomiting. If skin irritation occurs: Get medical advice / attention. If eye irritation persists: Get medical advice / attention. Take off contaminated clothing and wash before reuse. Dispose of contents / container to an approved waste disposal plant. Read through our forum on Myrcene below, or start your own topic. This forum contains 1,204 topic and 587 replies, and was last updated by Lillysom 13 hours, 4 minutes ago.